At the UN General Assembly [September 2016], Vanuatu, Solomon Islands, Tonga, Nauru, Marshall Islands and Tuvalu raised the West Papua case and called for UN action in order to stop human rights abuses committed by Indonesia. The leaders of the Pacific islands also demanded the right of self-determination to the Indigenous Peoples of West Papua to be respected. 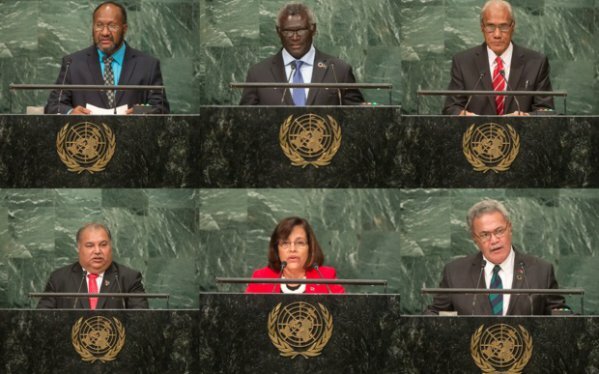 Leaders of six Pacific Island nations have highlighted concern about West Papua while speaking at the United Nations General Assembly. At the general debate of the Assembly's 71st session, Vanuatu, Solomon Islands, Tonga, Nauru, Marshall Islands and Tuvalu called for UN action on alleged human rights abuses in Papua. Calls for West Papuan self-determination rights to be respected were also made by some of the leaders. Human rights abuses in Papua region were linked by the Solomon Islands prime minister to the pursuit of self-determination by indigenous West Papuans. Manasseh Sogavare said there was a case to challenge the legality of the controversial, UN-sanctioned process by which Papua was incorporated into Indonesia. "Human rights violations in West Papua and the pursuit for self-determination of West Papua are two sides of the same coin. Many reports on human rights violations in West Papua emphasise the inherent corroboration between the right to self-determination that results in direct violations of human rights by Indonesia in its attempts to smother any form of opposition." In a call echoed by the other Pacific leaders, the Marshall Islands president, Hilda Heine, pushed for the situation to be independently probed. Jakarta's response to the speeches came from an official at Indonesia's permanent mission to the UN. Nara Masista Rakhmatia said her government categorically rejected accusations of rights abuses in Papua, accusing the governments concerned of interfering in Indonesia's sovereignty. She singled out Vanuatu and Solomon Islands, suggesting other countries with human rights problems shouldn't point the finger at Indonesia. "These countries are using the general Assembly to advance their domestic agenda, and for some countries to divert attention from political and social problems at home.The said countries are also using false and fabricated information as the basis of their statement. The conduct of these countries undermines the UN charter and are detrimental to the credibility of this assembly." The official reiterated Jakarta's stand that it has mechanisms in place to deal with human rights abuses in Papua. Yet the prime minister of Tuvalu, Enele Sopoaga said that the UN must not ignore what is happening to Papua's indigenous Melanesians. "It must not allow actions in the guise of principles of non-interference and sovereignty as reasons for inaction. The UN must act on this issue and find a workable solution to give autonomy to the Indigenous Peoples of West Papua." Nara Masista Rakhmatia said the Pacific leaders' statements on Papua were "politically motivated and designed to assist separatist groups which have violently attacked civilians". However, it's understood to be the first time so many governments have raised concern about West Papua at a General Assembly debate.